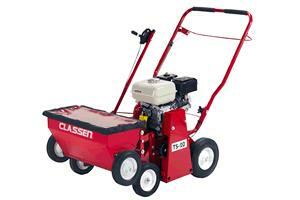 Multipurpose machine for seeding a new lawn or overseeding an existing lawn. Front seed drop ensures follow up soil coverage over seed for better germination. Folding handle for easy transportation. 26 heat treated multipurpose blades, uniquely designed with cutting edge on both ends of blade for double the life. * Please call us with any questions you may have about our gasoline lawn seeder not self propeled in Kingsport TN, Johnson City, Elizabethton, Rogersville TN, Gate City VA and the NE Tennessee, SE Kentucky and SW Virginia Tri-State Area.